Need a Weeknight Chicken Pot Pie Recipe without the hassle of all the pans and dishes? This one is for you. 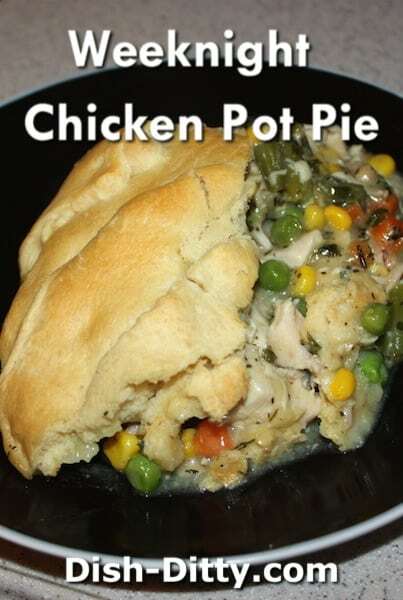 Preparation is only a couple of minutes, stovetop cooking is only about 10 minutes, then another 20 minutes and you have a delicious home cooked chicken pot pie cooked in one pot that is too good to believe. 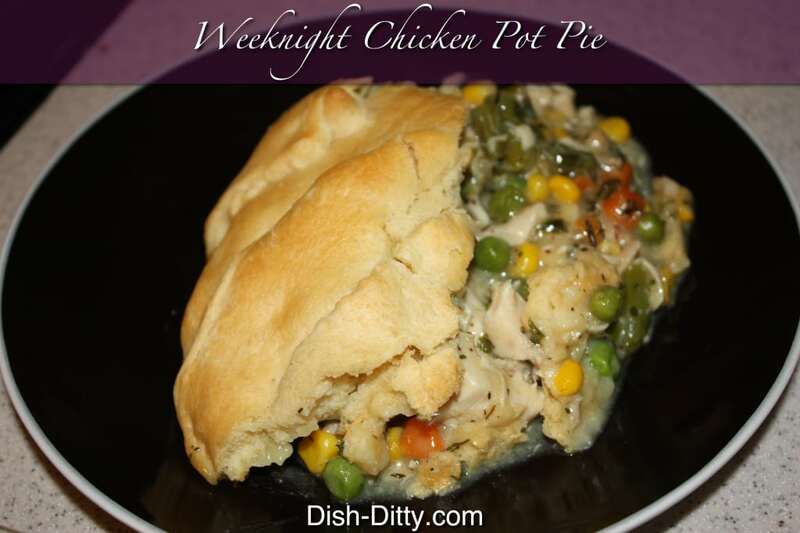 Need a Weeknight Chicken Pot Pie Recipe without the hassle of all the pans and dishes? This one is for you. 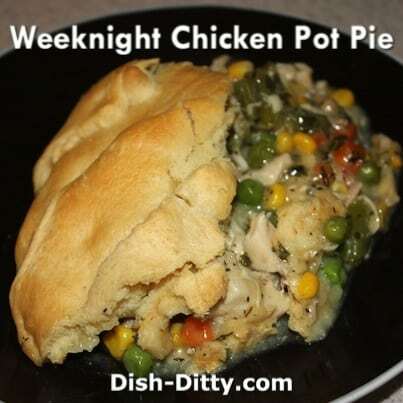 Preparation is only a couple of minutes, stovetop cooking is only about 10 minutes, then another 20 minutes and you have a delicious home cooked chicken pot pie cooked in one pot that is too good to believe. I prefer to use a blend of peas, carrots, corn and green beans for my mixed frozen vegetables.. In dutch oven (or large pot that is oven safe), sauté butter with green onions and chicken for about a minute until chicken starts to get hot. Add Vermouth and cook for one more minute. Next add thyme, better than bouillon, pepper, parsley, and veggies. Cook and stir for a couple of minutes until the vegetables bouillon is well incorporated. Add the milk and bring to a boil. Slowly add cornstarch and water mixture. Bring back to a boil and cook for at least one minute to thicken the gravy. Remove from heat. 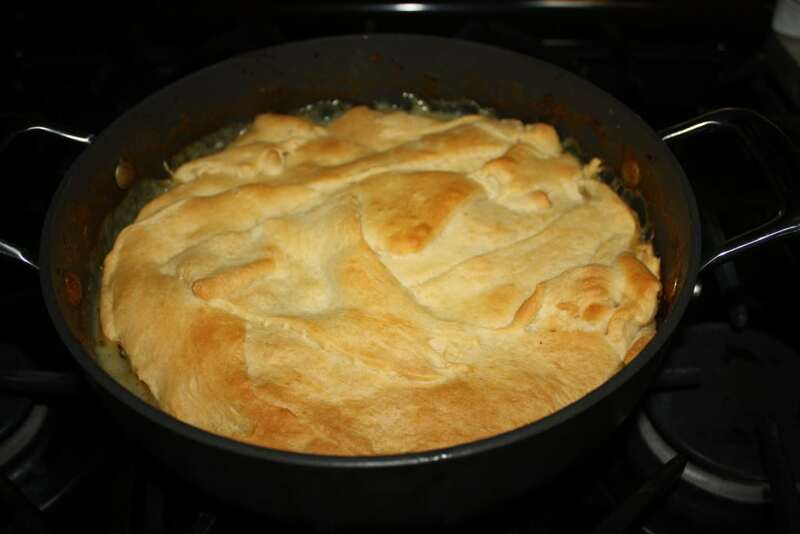 Layer the crescent rolls on top of the chicken mixture. It’s ok to have a couple holes and no need to seal to the edges. Place in oven at 350 degrees for 20-25 minutes, or until the crescent rolls are light brown in color. Remove from oven and serve. No Replies to "Weeknight Chicken Pot Pie Recipe"